The arteries are the plumbing system of our body – they carry blood rich in oxygen and nutrients to every cell. Just like a house with bust plumbing is doomed, so too is the body if we let the arteries get clogged and hardened. Food high in saturated fats, processed sugars and chemicals, smoking and excessive alcohol consumption, and lack of exercise, will reduce the arteries’ circumference, as gunk gets deposited on the walls. 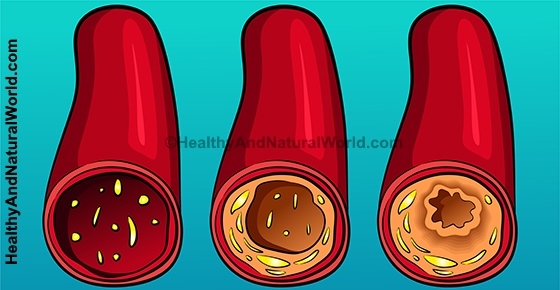 This condition is known as arteriosclerosis – thickening of arterial walls due to plaque buildup, and it’s a major risk factor for heart disease, heart attack and stroke. Heart disease is the leading cause of death around the world, especially in the West, and it affects people of all ages and backgrounds. Can You Reverse Clogged Arteries? According to WebMD, simple life changes, including what you eat, can undo some of the damage to the arteries. They mention Dr. Dean Ornish whose studies show that significant lifestyle changes had major effects on heart health. His studies show that even severely blocked arteries in the heart became less clogged after a year, and there was even further reversal after 5 years. You can find more detailed information in my article about the 5 Lifestyle Changes that Could Prevent Nearly 80% of Heart Attacks. Just as you can make your arteries deteriorate by what you eat, you can also keep them healthy by choosing the right foods. Kiwifruit and cantaloupe are antioxidant-rich fruits that lower the LDL cholesterol (dubbed ‘bad cholesterol’) in the blood, and reduce plaque buildup in the arterial walls. One medical study concluded that kiwifruit can lower cardiovascular risk factors. Cantaloupe contains fiber, potassium, vitamin C, and choline that help to keep your heart healthy. Eat one kiwifruit a day, or a cup of cantaloupe. Salmon, tuna and herring all contain omega-3 fatty acids, which are a source of good fats and prevent the clogging plaque from forming in the arteries. According to Harvard Medical School eating fish is linked to fewer heart attacks. Make sure you get sustainably caught fish, and avoid buying farmed salmon, as its meat usually contains toxic chemicals and has less omega-3 fatty acids. Read here more about the amazing health benefits of omega-3 fish oil. Taking omega 3 is also one of the 70 habits featured in my e-book 70 Powerful Habits For A Great Health which will guide you how to take positive steps to improve your wellness and overall health. Grapes contain flavonoids (natural antioxidants), which stop the bad cholesterol from oxidizing. According the medical journal, Nutrients, flavonoids could help prevent heart disease and protect the arterial walls. Strawberries, cherries, cranberries and other berries contain powerful antioxidants and are packed with vitamins. Buy them organic to avoid the pesticide overload. You can find more information about the incredible healing properties of berries in my e-book The Healing Berry Guide. Garlic has many medicinal properties and one of them is protection against heart disease. Garlic reduces blood pressure and bad cholesterol levels. For example, one study found that taking garlic can both prevent heart disease and treat symptoms of heart disease. For medicinal effect, eat one to two minced raw garlic cloves. If you use supplements, look for the amount of allicin which is the garlic’s active ingredient. Also make sure to avoid these common mistakes when using garlic for its medicinal benefits. An apple a day keeps the doctor away. The pectin (soluble fiber) in these fruits, lowers the bad cholesterol, while the minerals potassium and magnesium help to control blood pressure. Magnesium also helps to prevent plaque buildup in the arteries, helping to prevent clogged arteries. Spinach is rich in vitamins A and C, which help to prevent the clogging plaque from developing in the arteries. One medical study claims that vitamin C is a powerful antioxidant that “inhibits oxidation of LDL-protein, thereby reducing atherosclerosis.” The same study suggests that vitamin C deficiency is associated with a higher risk of mortality from heart disease. Popeye’s favorite food also contains lots of potassium and folic acid, thus lowering blood pressure. Studies showed that drinking one or 2 tablespoons every day of extra virgin olive oil can help to keep your heart healthy and prevent heart disease. Make sure to use extra virgin olive (EVOO) and apply moderation in the amounts you consume as fat is still fat. According to studies, you only need to consume 40 ml of olive oil weekly to protect your arteries and prevent heart disease. Read more about the fantastic health benefits of olive oil. Tomatoes contain powerful antioxidants that prevent the oxidization of LDL cholesterol and keep your arteries clean. According to medical studies, tomatoes are a rich source of lycopene, beta-carotene, folate, potassium, vitamin C, flavonoids, and vitamin E. If you consume tomatoes regularly, you can cut your risk of arteriosclerosis by 50%. Flavonoids in green tea are powerful antioxidants. According to one medical study drinking a few cups of green tea every day is associated with a lower risk of stroke and cardiovascular disease. A good quality green tea will also prevent the formation of blood clots and help maintain healthy linings of the arteries. Find more information about the amazing health benefits of green tea. Pomegranate is another great antioxidant-rich fruit. Pomegranate prevents the hardening of the arteries and can even reverse arteriosclerosis. Back in 2000, a study published in the American Journal of Clinical Nutrition, provided evidence that pomegranate’s juice has potent antiatherogenic effects. In other words, pomegranate juice can protect against the formation of fatty deposits within the walls of arteries. This was connected to the fruit’s antioxidative properties. Pomegranate is rich in polyphenols and other antioxidants. These play an important role in the prevention of atherosclerotic lesions and decrease oxidation of LDL (low-density lipoprotein) cholesterol. In 2004, a group of Israeli scientists examined the effect of pomegranate juice on a group of patients with an already existing carotid artery stenosis (narrowing of the arteries that supply the head and neck with blood). Ten patients were given pomegranate juice for one year and five of them continued for up to three years. The results showed a reversal in carotid artery stenosis by up to 30%. Patients’ blood pressure decreased as well. People in the control group, who did not consume pomegranate juice, had their arterial blockages increased by 9%, which gave further support to pomegranate’s heart-protecting potential. In 2013, the journal Atherosclerosis published a pomegranate-related study. Mice with a genetic susceptibility towards spontaneous coronary artery blockages were given pomegranate extract. After two weeks, it was observed that the atherosclerotic features reduced. This study, too, confirmed that pomegranate reduces oxidative stress and inflammation in the vessel walls, which protects the blood vessels against the formation of ominous plaque. It has an anti-inflammatory effect – inflammation often plays a major role in the development of chronic conditions, including heart disease. You can read more about inflammation and the damage it causes in my previous article. It lowers blood pressure. Find here more ways to reduce you blood pressure naturally. It has anti-bacterial and anti-viral properties – secondary viral and bacterial infections often develop due to plaque buildup, including hepatitis C and Chlamydia pneumonia. It is a powerful antioxidant and reduces oxidative stress in the blood. Pomegranate both prevents and reverses atherosclerosis. It improves blood flow through the heart and promotes a healthy blood pressure, giving you an all-round protection from heart and vessel diseases. Including this fruit in your diet appears to be a good decision. Eat it fresh or get concentrated juices and extracts and enjoy its taste and health benefits. Research has shown some heart health benefits from as little as two ounces of pomegranate juice a day. There are many more reasons to eat pomegranate every day. Due to the high content of soluble fiber, oats lower “bad” cholesterol (LDL) by removing it from the body. According to medical studies whole grains help to keep the artery walls clean and prevent heart disease. In fact whole grains are proven to protect your heart. Eat 1/2 cup of oat-bran cereal daily to help reduce your bad cholesterol levels and cleanse your arteries. You can eat it for breakfast and add in oatmeal or bran to dishes at other times of the day. Walnuts contain polyunsaturated fats that are primarily found in plant-based oils and foods and can improve your cholesterol levels, decrease your heart disease risk, lessen your chance of type 2 diabetes and regulate blood pressure. Walnuts also contain omega-3 fatty acids that help clear clogged arteries. Eating a small, palm-sized portion of walnuts per day will help to clean the arteries and keep blood flow strong throughout your body. There are other healthy reasons to eat walnuts every day. Turmeric is a common spice that has many health benefits. Turmeric may protect the arteries from fatty buildup according to a research in mice. The study suggests that curcumin, the active ingredient in turmeric, may prevent the development of clogged arteries which is a major risk factor for heart attacks and strokes. Curcumin is not easily absorbed by the body, but you can increase its absorption using the suggestions in my article on how to optimize turmeric absorption for super boosted benefits. Excellent list, but don’t forget we still each have to figure out which foods are friendly and which foods are toxic to our individual bodies – we are all different. I have reactions to 3 of the foods (1, 8 & 11) on this list. Keep a “food/feeling” diary. Yes you’re correct…. Simple and easy to find. It’s a matter of checking if organic or from the wild for salmon. How about some tropical fruit, say banana, avocado & pineapple? Hope there are also study on these tropical fruits. Sweet potato is also good for you. In the Philippines, we have something called “Palawan” its very good source of fiber. PLEASE make sure u eat organic apples. conventional apples are a chemical disaster. (https://www.healthyandnaturalworld.com/the-15-most-pesticide-ridden-fruits-vegetables/). See in the article how to avoid pesticide exposure while still maintaining a healthy diet, and indeed organic is the best option. Forget it. You’re going to die- when you’re going to die. My husband walked 5 miles a day, played volleyball, was a black belt in judo, did not drink or smoke, ate all healthy foods and dropped dead of a heart attack at 63 with no warning. My condolences on your loss, but there are plenty of other reasons that he passed away so unexpectedly. Our foods are so badly polluted with additives that anyone of them could have caused a problem. While no one seems to know for certain how GMO products affect us, they could cause enough havoc to our bodies to lead to an untimely death. Most importantly, like you said, it happens when it happens. We don’t know why most of the time, but the Lord knows. Keep your trust in him. Very nice.I got very useful information from yoursite.But I will add two thing in modern food market,which is badly affected our health.One is synthetic Nitrate,potassium,pospors and other chemical substance which we provide to our field.Second thing is Farming chicken and fish.Due to these synthetic food today people sufferad in many kind of diesease.please avoid from these syntactic food. What we eat we become like that..so choose the best possible from the earth which is god is created in the nature. Ganoderma mushroom is a amazing herb . THIS MUSHROOM called commonly AS THE KING OF HERB.The number one detoxifying agent.help to balance the IMMUNE system.